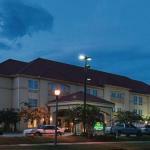 Complimentary breakfast free Wi-Fi and in-room microwaves and mini-fridges are highlights of the pet-friendly La Quinta Inn & Suites Slidell - North Shore Area. All 59 rooms at the three-story La Quinta include amenities like coffeemakers microwaves mini-fridges and free Wi-Fi. Start the day at the hotel's free breakfast buffet which features scrumptious items like breakfast sandwiches biscuits and gravy eggs waffles bagels fresh fruit coffee and juice. Bask in the warm Louisiana sun while lounging by or floating in the outdoor swimming pool. There's also a hot tub for relaxation. Work out on cardio equipment in the fitness room or freshen up your vacation wardrobe in the guest laundry. The on-site business center offers computer access plus copy and fax capabilities so you can check your email or print a boarding pass. Pets are welcome for a small fee. Parking is free. La Quinta is one mile east of I-10 just north of U.S. 190 three-and-a-half miles from the heart of Slidell. Points of interest within a two-mile radius of the hotel include Midtown Square Shopping Center Ochsner Medical Center-North Shore Pope John II School and a Northrop Grumman office. New Orleans is a half-hour south of the hotel. Louis Armstrong New Orleans International Airport is 44 miles away. Dogs of all sizes are allowed for no additional fee; there is a pet policy to sign at check in. A contact number must be left with the front desk if there is a pet alone in the room.